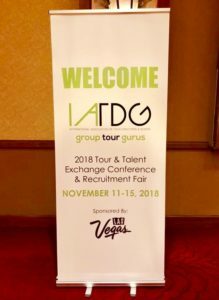 The Las Vegas Tourist Guides Guild is pleased to welcome the 2018 International Association of Tour Directors and Guides (IATDG) Annual Conference of Group Tour Gurus to Fabulous Las Vegas! The conference is taking place at the South Point from November 11 through November 15. Along with our partners at the LVCVA, we’re excited for the opportunity to share and explore some of our city’s vibrant history, sights, and attractions with our IATDG colleagues. We have a fleet of buses ready to roll, our Las Vegas guides standing by, and a list of shows, sites, and attractions rolling out the red carpet. Sunshine fun, blue skies, and sandstone mountains meets 24/7 entertainment, glittering lights, and neon nights. Welcome IATDG! Las Vegas Tourist Guide Guild shared a link.